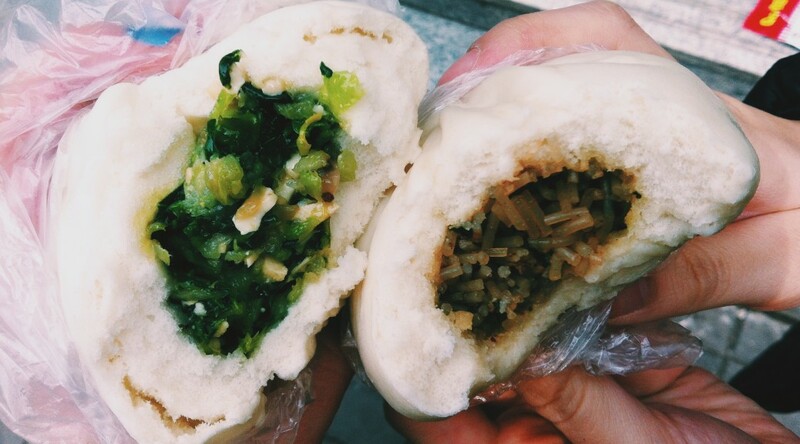 Bāozi (Chinese: 包子) is a pillowy-soft, steamed bun that is filled with savory or sweet centers. Although locals prefer to eat them for breakfast, they are sold from the early hours of the morning until late afternoon. Each one is typically 1.5 kuai out of stacks of bamboo steamers alongside shao mai. The bun’s dough consists of water, dry yeast, sugar, bread flour, baking powder, salt and sesame oil. The yeast and sugar are combined in warm water and allowed to sit. After the flour and sugar are combined, the yeast water is added to the mixing bowl until a ball of dough is formed. The dough is kneaded and allowed to rest in a humid environment. After the dough has risen, baking powder is kneaded into the dough before it is divided into two long rolls and cut into pieces. Each piece of dough is formed into a ball that is rolled into a disk so that the filling can be encased in the center. Each ball of dough is allowed to rise before being placed into bamboo steamers. During the Three Kingdoms period, Zhuge Liang, a military strategist of the time, was on an expedition to Southern China when he and his army found themselves unable to cross a river because the storm was too violent. He asked Meng Hua why they couldn’t cross, and he stated that the war had caused so many deaths that angry spirits were trapped there, unable to return to their families. The spirits claimed that they needed 49 people to sacrifice themselves in order for Zhuge Liang and his soldiers to cross the river. Zhuge Liang wasn’t willing to allow even more people to die, so he asked his cook to make him 49 buns with dough that resembled skin with beef or mutton fillings so that he could trick the spirits into believing that they were real people.